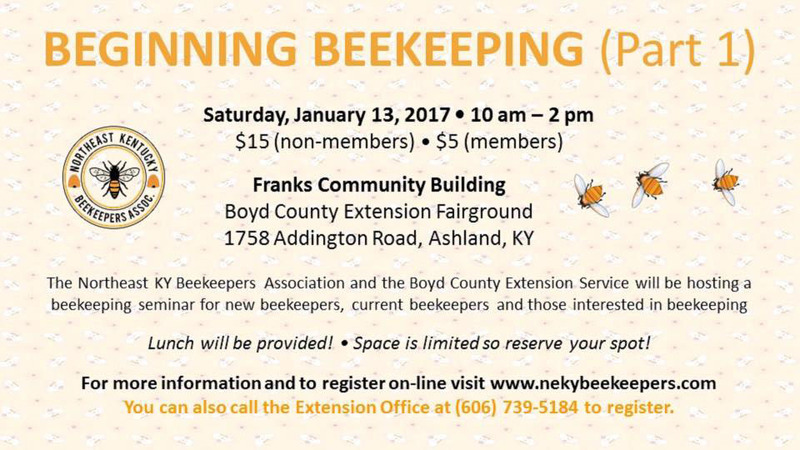 On Saturday, January 13, 2018, the Northeast Kentucky Beekeepers Association and the Boyd County Extension service will host a beekeeping seminar for new beekeepers, current beekeepers, and those interested in beekeeping. The seminar will take place from 10:00 – 2:00 ET in the Franks Community Building at the Boyd County Extension Fairground (1758 Addington Road, Ashland, KY 41101). The fee is $15 for non-members or $5 for members. Lunch will be provided. For more information or to register, please call the Extension Office at 606-739-5184 or visit the Northeast Kentucky Beekeepers Association’s website.